Kutná Hora is a small town in Central Bohemia, about 70 km east of Prague. It may be a small town today, but centuries ago it competed for importance with the Golden City. Looking at Prague today, it may not be easy to imagine, but it is nevertheless true. 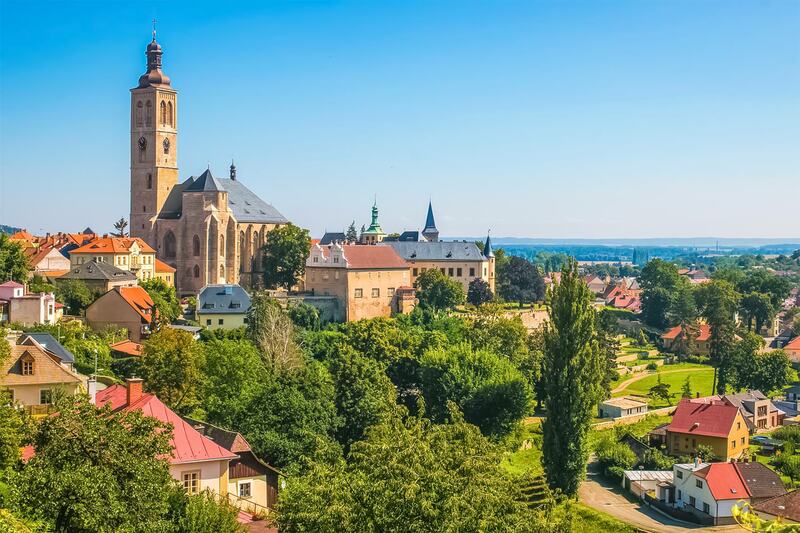 Kutná Hora owed its position and wealth to the silver mines that had been established there in the Middle Ages. At the end of the 13th century, roughly one third of all silver produced in Europe came from this region. Nowadays, the town has a population of only approx. 20,000 people but is a very attractive tourist destination and a great place for a day trip from Prague. Kutná Hora město / Kutná Hora hl. 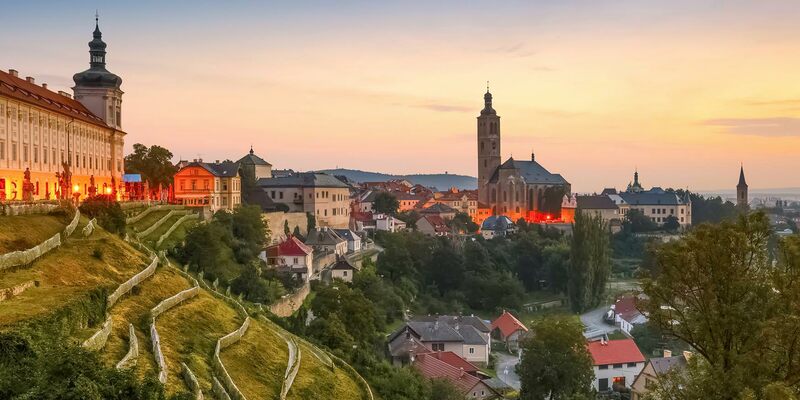 n.
The Historical Town Centre of Kutná Hora with the Church of St. Barbara and the nearby Cathedral of Our Lady at Sedlec was inscribed on UNESCO’s World Heritage List in 1995, as the fifth World Heritage Site from Czechia. Saint Barbara’s Church (Chrám svaté Barbory) is a beautiful Gothic church that is featured in many postcards from Kutná Hora. Its construction was started in the 14th century and finished only in the early 20th century, but that is because of long periods during which the work was interrupted. St. Barbara is the patron saint of miners and silver mines played an important role in the history of the town. The church is open daily and there is a small entrance fee for tourists. More information about the opening times can be found here. 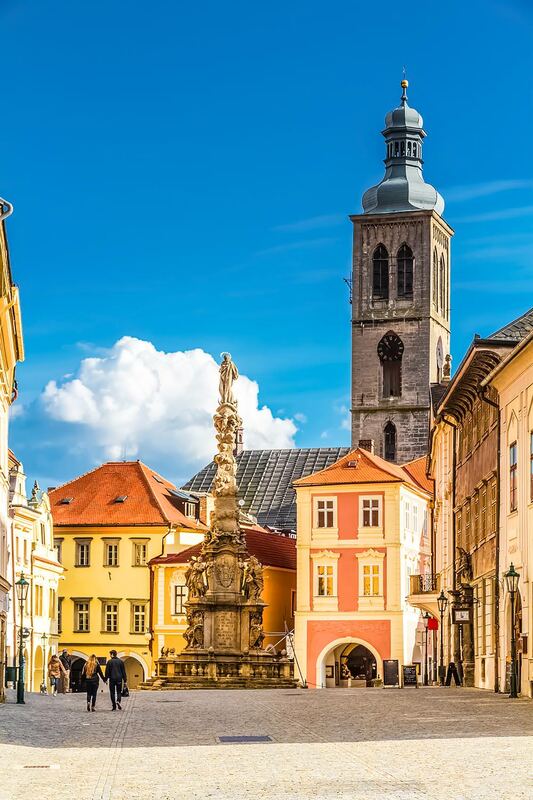 The church is located on 1 Jakubská Street, which is very close to the center of this picturesque town. The Sedlec Ossuary (Sedlecká kostnice) is also known as the Church of Bones, and it definitely is not your typical tourist attraction. As a matter of fact, classifying it as a tourist attraction might be considered by some people inappropriate. 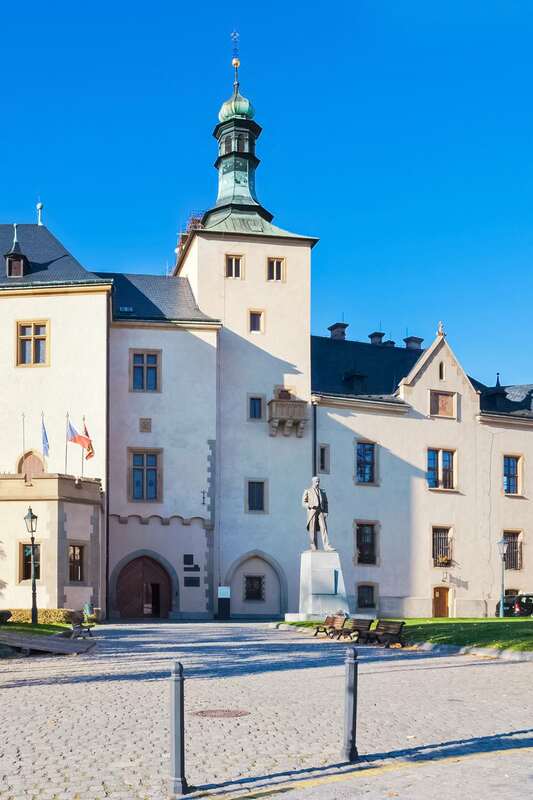 Nevertheless, it is visited by more than 300,000 tourists yearly, which is only a little less than the magnificent castle in Český Krumlov. Sedlec is a suburb of Kutná Hora. The Chapel of All Saints where the ossuary is located, and the Church of the Assumption of Our Lady and Saint John the Baptist are the remnants of the former Cistercian monastery in Sedlec. What makes the ossuary so unique is the artistic use of … human bones and skulls to create decorations for the chapel. There are garlands and chandeliers made of bones and skulls. Near the entrance you will see a large imitation of the coat-of-arms of the powerful Schwarzenberg family, created only with bones and skulls. You may take photos of the ossuary only for personal use and without flashes or tripods. Commercial photography/videography is prohibited. Photography for documentary or educational purposes is only permitted if you obtain a written permission from the Bishopric of Hradec Kralové in advance. Information about the opening times and entrance fees can be found here. The Jesuit College (Jezuitská kolej) is an Early Baroque building next to Saint Barbara’s Church. It was designed by the Italian architect Giovanni Domenico Orsi, the same artist who designed the Theological Hall in the famous Strahov Monastery in Prague. 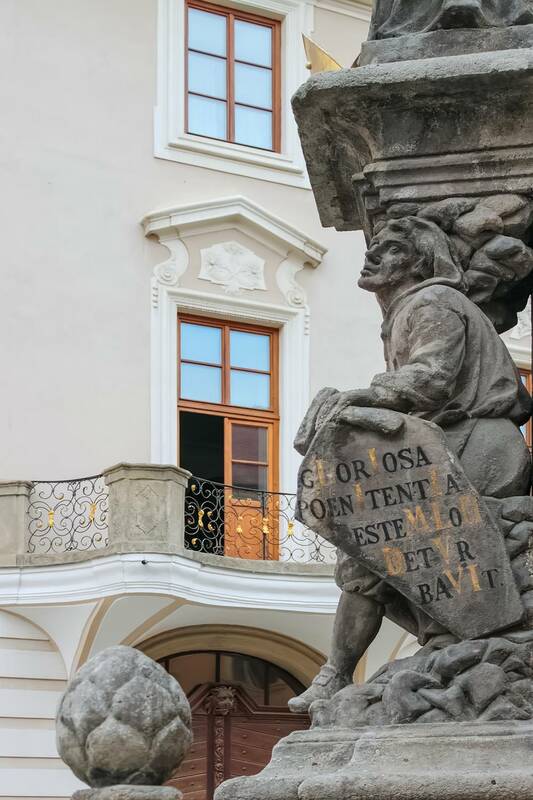 The construction of the Jesuit College was started in 1667 and completed only in 1750, many years after Orsis death. In 1773, the Jesuit Order was disbanded in Bohemia and the building was taken over by the military and used as a training center. Nowadays, it houses the Gallery of the Central Bohemian Region (Galerie Středočeského kraje). It presents modern and contemporary art. You can easily recognize the building’s silhouette in the skyline of Kutná Hora. The Italian Court (Vlašský dvůr) is a palace located on Havlíčkovo Square (Havlíčkovo náměstí) near the Church of St. James (kostel svatého Jakuba). The palace housed a royal mint originally, and it was named after Italian minting specialists. The minting reform in Bohemia in 1300 introduced a new coin: the Prague groschen. The minting of this new coin was concentrated next to the country’s richest silver deposits, which happened to be around Kutná Hora. The minting reform triggered thus the rapid growth of the town in the subsequent years. The Italian Court served also as a residence of Bohemian kings during their visits to Kutná Hora. Nowadays, it houses a museum of coin minting. Like many other towns in Bohemia and Moravia, Kutná Hora also has its Plague Column (Morový sloup). 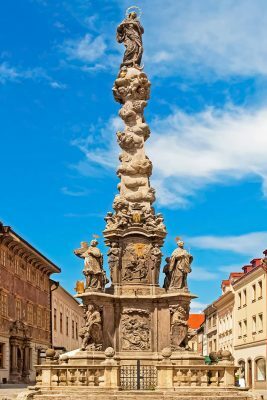 This Baroque column was built between 1713 and 1715, as thanks for surviving the plague epidemic. It is located on Šultysova Street, in the centre of the town. The Stone Fountain (Kamenná kašna) is located on Rejskovo Square (Rejskovo náměstí). It was built in the Late Gothic style at the end of the 15th century. 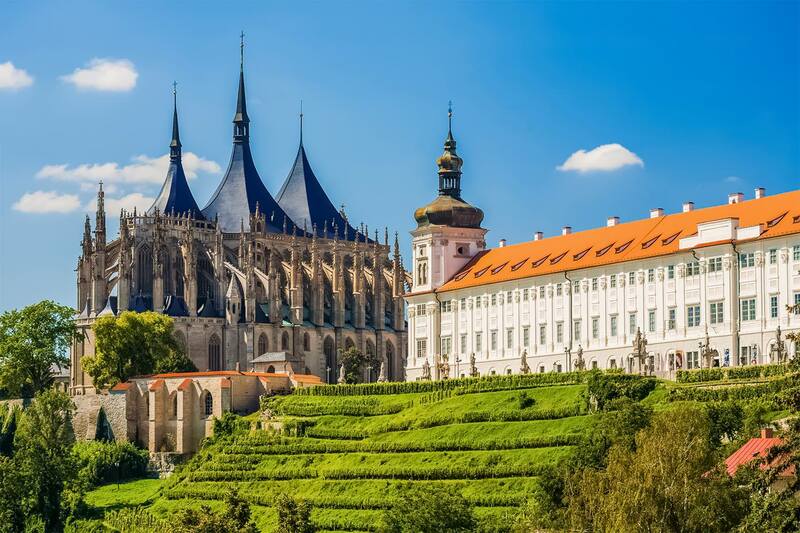 It served as a source of drinking water for the people of Kutná Hora until 1890. Hrádek literally means “small castle” in Czech. It is a former Gothic fortress, converted into a palace at the beginning of the 16th century. Today, Hrádek houses the Czech Museum of Silver. It is located on 9 Barborská Street, in the center of the town. The Stone House (Kamenný dům) is an impressive example of Late Gothic architecture. In the 15th century it belonged to the burgher Prokop Kroupa. Nowadays, the Stone House is one of the buildings belonging to the aforementioned Czech Museum of Silver. 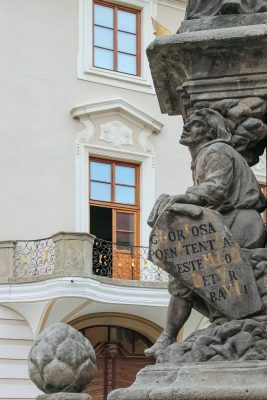 The address is: Václavské náměstí 183/26. Do you prefer sightseeing in an organised group with a local English-speaking guide? 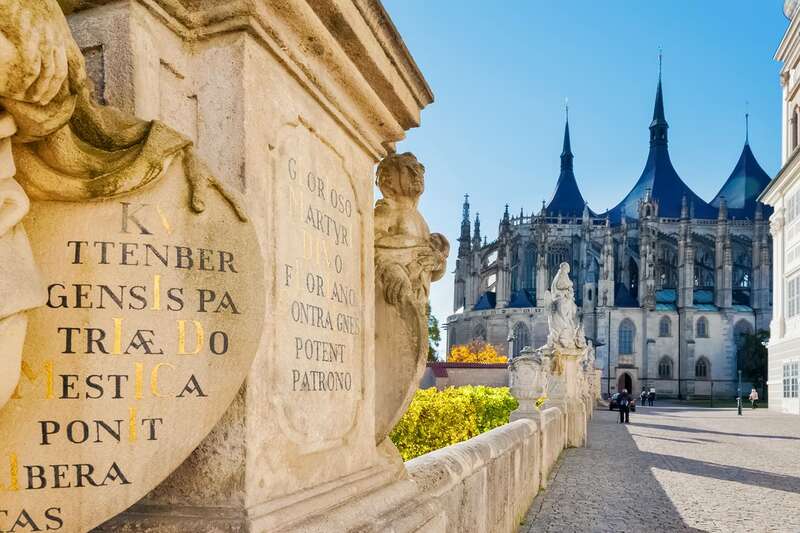 The organizers of Kutná Hora Day Tours from Prague will take care of everything. Your guide will show you this amazing town and its treasures. After arriving at the meet-up location in Prague, the guide will take you to the train station. You will travel to Kutná Hora by train. You will return to Prague in the early evening, on the same day. Check the availability and book your tour. 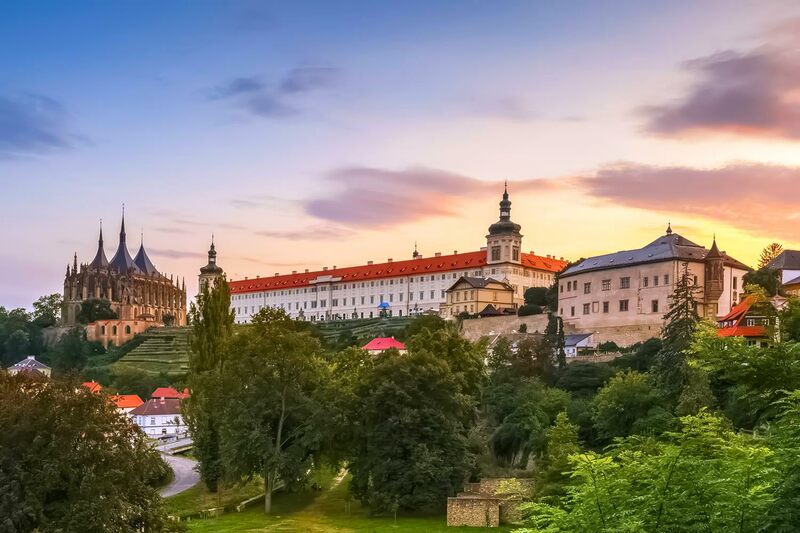 Because of the short distance from Prague to Kutná Hora, getting there by public transportation is very easy if you’re staying in the capital of Czechia. There are several train stations in the town. For tourists, the most interesting are: Kutná Hora hl. n. (Main Station), Kutná Hora město (town) and Kutná Hora Sedlec. Kutná Hora město is the closest one to the town’s centre, but it doesn’t have direct connections with Prague. Direct trains from Prague arrive at Kutná Hora hl. n. only. There you can change to a local train going to Kutná Hora Sedlec and Kutná Hora město. Kutná Hora Sedlec will be the most convenient station if you’d like to start sightseeing from the Sedlec Ossuary (the Church of Bones). If your plan is to see the sights in the centre first, then Kutná Hora město will be the most convenient stop to get off. Direct trip from Praha hl.n. to Kutná Hora hl.n. typically takes about 50 minutes. If you change to a local train there and go to Kutná Hora město, the total journey time will be slightly more than 1 hour. Information about where to check the timetables and purchase tickets can be found here. A convenient alternative to trains can be private transportation. In Czechia, this option doesn’t have to be expensive. The Czech market leader in this field is Prague Airport Transfers. 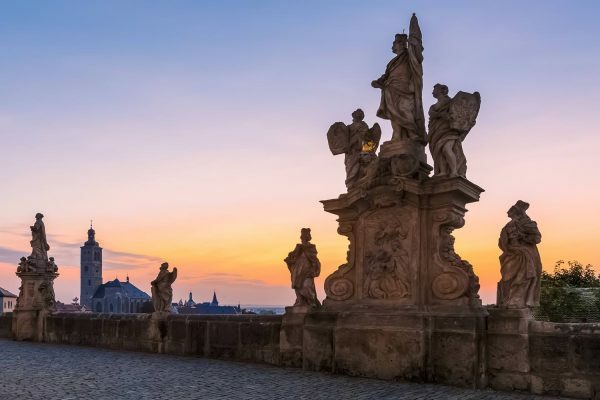 Their company name is somewhat misleading, because they can take you or your group from any place in Prague to many such great places as e.g. Kutná Hora. If you return on the same day, you pay only a one-way fare + a low hourly waiting fee, which is very fair. The advantage is that you don’t have to worry about timetables, tickets, etc. Depending on the number of people in your group, they can provide a sedan car, a minibus or a coach. 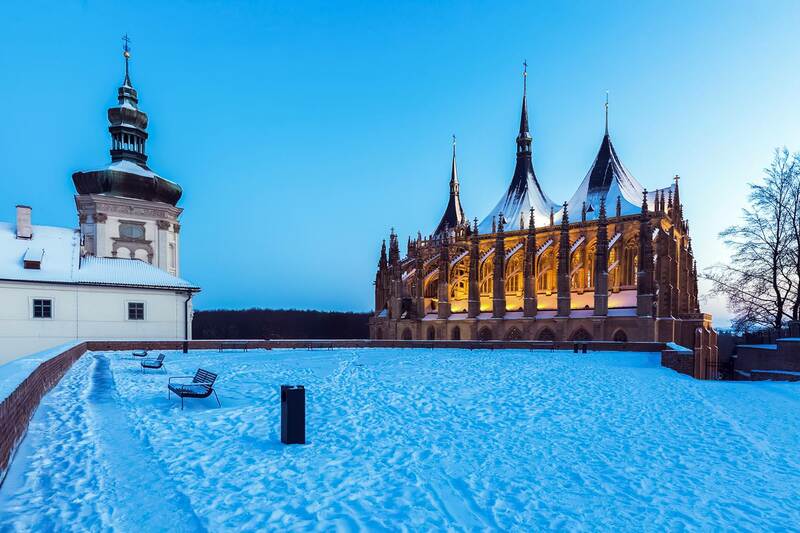 Prices for trips from Prague to Kutná Hora can be found here. 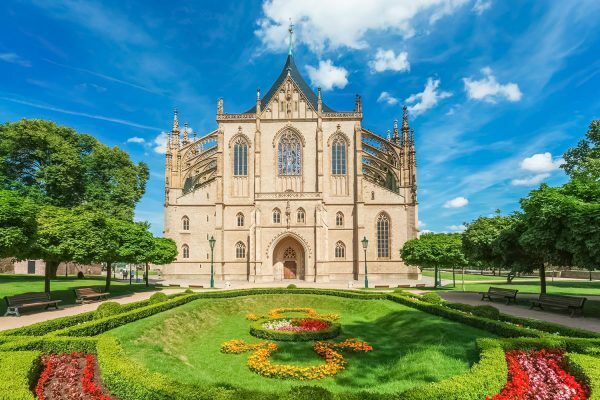 They also offer guided tours of Kutná Hora. The details can be found here.